Lotus Nail Spa Rewards Program. 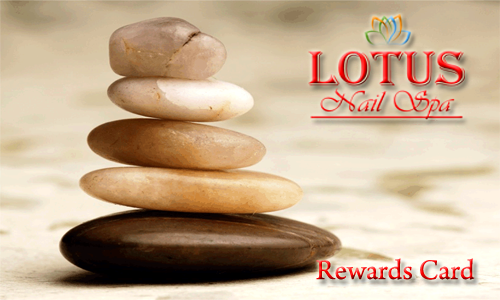 Lotus Nail Spa Rewards offers exclusive benefits to its participants. As a Reward Card holder of the Lotus Nail Spa Reward Program, you can earn points toward free services such as, free manicure, spa pedicure, lotus pedicure, deluxe pedicure or even your own facial services every time you visit Lotus Nail Spa. You can go here to check the balance on your Reward Card. Reward Card Balance. With the Lotus Nail Spa Reward Program, you can earn points for every dollar you spent for your services at Lotus Nail Spa. The more you spend the faster your points will add up. You can accumulate Rewards points over time and trade in for free services. There is no limit on how many points you can accumulate and that your points will never expire. Rewards Card costs $5 dollars to purchase and it comes with 20 points to help you earn your rewards faster. Take a look at all the benefits you will get as a member of our Rewards Program. Earn Points for free services such as, free manicure, pedicures or facial services. Terms and Conditions: Participation in the Lotus Nail Spa Rewards program is subjected to the terms and conditions, rules, regulations, policies and procedures that Lotus Nail Spa may, in its discretion, adopt from time to time. Lotus Nail Spa may amend the Program Rules at any time without notice. Lotus Nail Spa has the sole discretion to interpret and apply the Program Rules. Lotus Nail Spa reserves the right to change the reward and/or any information on this page with or without notice. Lotus Nail Spa will not reimburse Rewards Points on any lost or Stolen Card. Lotus Nail Spa will charge $5 for card replacement and Reward Points will be set to zero. Reward points are not redeemable for cash. The number of points required to redeem any reward may substantially increase, any reward may be withdrawn, and restriction on any reward or its redeemption may be imposed at any time. Customer must present the Rewards Card at time of purchase for points to be added and that reward points will not be added at later time. Customer must also present the physical Reward Card to redeem the rewards. Lotus Nail Spa will not accept any other forms of Reward Cards; either on the phone or the picture of the card. Copyright 2019 Lotus Nails Spa All Rights Reserved.